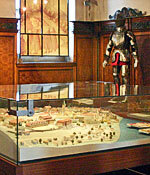 The Regional Museum is located in the old town hall of Litoměřice, which is a protected monument. 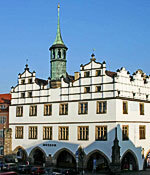 Built in 1535–37, it is one of the earliest Renaissance buildings to be found in the centre of any Bohemian town. On the pillar at the northern corner is a copy of the statue of Roland by J. Kaifoš, the original of which is in the museum. The iron rod indicating an ell – an old unit of measurement – fixed to the lower section of the pillar is an interesting detail. Customers who purchased cloth at the marketplace could use it to check the length. Until 1762, a pillar facing the marketplace had a pillory attached to it, the remains of which are now set into the masonry between two arches in the Lange Gasse. The Regional Museum features diverse permanent exhibitions, presumably created in the 1970s, on such subjects as the geological and historical development of the region from the earliest times to the year 1945. Important displays include ceramic finds from the Levín region, everyday objects relating to the Elbe fishermen, a model of the town of Litoměřice as it looked in about 1700, a model of the battle of Lovosice, a model of Roudnice Castle and a beehive in the form of a pig.